Blend, Mix or Shake 1 rounded scoop (30g) with ~5 oz (150 ml, 3/4 of a cup) of cold water or low-fat milk, depending on desired taste and consistency, anytime you want an ultra-premium high-protein beverage. Use only as directed. For adult use only. Consult a health care practitioner prior to use if you are pregnant or breastfeed; if you have liver or kidney disease, or if you have been instructed to follow a low protein diet. Do not use if outer seal is broken. Store in a cool, dry place. KEEP OUT OF REACH OF CHILDREN. For additional information, see allergen warning. HYBRID-RATIO ION-FILTERED WHEY PROTEIN ISOLATE (Cross-Flow, Ultra-Filtered Whey Protein Isolate, Ion-Charged Particle-Filtered Whey Protein Isolate, Alpha-Lactalbumin-Rich Whey Isolate), PROTEIN ENZYME BLEND (Protease, Bromelain), Natural and Artificial Flavors, Guar Gum, Lecithin (Sunflower), Acesulfame Potassium, Sucralose. Whey Protein Isolate Complex [IsoFlex® Protein Blend (100% Instantized Ultra-Pure, Cross-Flow Microfiltered WPI90 90% Whey Protein Isolate, Hydrolyzed WPI97 97% Whey Protein Isolate, Alpha-Lactalbumin-Rich Whey Peptides), NOS Complex™ (L-Arginine, Taurine, Folic Acid), Glutamine Complex (L-Glutamine), LS Complex (Alpha Lipoic Acid, D-Pinitol, 4-Hydroxyisoleucine)]. Natural And Artificial Flavors, Banana Puree Powder, Lecithin, Guar Gum, Acesulfame Potassium, Sucralose. Mix or shake 1 scoop (30 grams) with 150 mL (6 ounces, 3/4 of a cup) of water, milk or juice. May use up to 8 scoops per day. Contains Milk (Whey). Produced in a facility that also handles soy, egg, peanut, tree nut, fish, crustacean and shellfish products. HYBRID-RATIO ION-FILTERED WHEY PROTEIN ISOLATE (Cross-Flow, Ultra-Filtered Whey Protein Isolate, Ion-Charged Particle-Filtered Whey Protein Isolate, Alpha-Lactalbumin-Rich Whey Protein Isolate), PROTEIN ENZYME BLEND (Protease, Bromelain), Natural & Artificial Flavors, Gum Blend (Cellulose, Xanthan, Guar), Birthday Cake Sprinkles (Sugar, Palm Kernel Oil, Corn Starch, Gum Arabic, Carnauba Wax), Acesulfame Potassium, Sucralose, Lecithin (Soy)], Lecithin (Sunflower), Birthday Cake Sprinkles Color (Allura Red, Tartrazine, Sunset Yellow FCF, Erythrosine, Brilliant Blue FCF). HYBRID-RATIO ION-FILTERED WHEY PROTEIN ISOLATE (Cross-Flow, Ultra-Filtered Whey Protein Isolate, Ion-Charged Particle-Filtered Whey Protein Isolate, Alpha-Lactalbumin-Rich Whey Protein Isolate), PROTEIN ENZYME BLEND (Protease, Bromelain), Natural and Artificial Flavors, Guar Gum, Lecithin (Sunflower), Salt, Acesulfame Potassium, Sucralose. Citric Acid, Malic Acid, Natural And Artificial Flavors, Lecithin, Anti-Foam, Sucralose, Acesulfame Potassium, FD&C Yellow #6. Allergy Alert: Contains Protein derived from Milk and Lecithin derived from Soy (less than 1%). Whey Protein Isolate Complex [IsoFlex® Protein Blend (100% Instantized Ultra-Pure, Cross-Flow Microfiltered WPI90 90% Whey Protein Isolate, Hydrolyzed WPI97 97% Whey Protein Isolate, Alpha-Lactalbumin-Rich Whey Peptides), NOS Complex™ (L-Arginine, Taurine, Folic Acid), Glutamine Complex (L-Glutamine), IS Complex (Alpha Lipoic Acid, D-Pinitol, 4-Hydroxyisoleucine)]. HYBRID-RATIO ION-FILTERED WHEY PROTEIN ISOLATE (Cross-Flow, Ultra-Filtered Whey Protein Isolate, Ion-Charged Particle-Filtered Whey Protein Isolate, Alpha-Lactalbumin-Rich Whey Protein Isolate), PROTEIN ENZYME BLEND (Protease, Bromelain), Natural & Artificial Flavors, Gluten-Free Cookie Crumbs [Rice Flour, Sugar, Tapioca Starch, Palm Oil, Cocoa Processed with Alkali, Corn Starch, Salt, Chocolate Liquor, Natural Flavor, Sodium Bicarbonate, Lecithin (Soy)], Guar Gum, Lecithin (Sunflower), Sucralose, Acesulfame Potassium. Citric Acid, Natural And Artificial Flavors, Lecithin, Anti-Foam, Sucralose, Acesulfame Potassium, Caramel Color, FD&C Yellow #5. Mix or shake 1 scoop (32 grams) with 10 oz (295 mL) of water. Contains Milk (Whey), Coconut. Produced in a facility that also handles soy, egg, peanut, tree nut, fish, crustacean and shellfish products. HYBRID-RATIO ION-FILTERED WHEY PROTEIN ISOLATE (Cross-Flow, Ultra-Filtered Whey Protein Isolate, Ion-Charged Particle-Filtered Whey Protein Isolate, Alpha-Lactalbumin-Rich Whey Isolate), PROTEIN ENZYME BLEND (Protease, Bromelain)Natural and Artificial Flavors, Coconut Powder, Guar Gum, Lecithin (Sunflower), Acesulfame Potassium, Sucralose. ALLERGEN WARNING: Contains Milk (Whey), Coconut. Produced in a facility that also handles soy, egg, peanut, tree nut, fish, crustacean and shellfish products. HYBRID-RATIO ION-FILTERED WHEY PROTEIN ISOLATE (Cross-Flow, Ultra-Filtered Whey Protein Isolate, Ion-Charged Particle-Filtered Whey Protein Isolate, Alpha-Lactalbumin-Rich Whey Protein Isolate), PROTEIN ENZYME BLEND (Protease, Bromelain), Natural and Artificial Flavors, Guar Gum, Lecithin (Sunflower), Sea Salt, Acesulfame Potassium, Sucralose. HYBRID-RATIO ION-FILTERED WHEY PROTEIN ISOLATE (Cross-Flow, Ultra-Filtered Whey Protein Isolate, Ion-Charged Particle-Filtered Whey Protein Isolate, Alpha-Lactalbumin-Rich Whey Protein Isolate), PROTEIN ENZYME BLEND (Protease, Bromelain), Natural and Artificial Flavors, Guar Gum, Ground Cinnamon, Acesulfame Potassium, Sucralose, Lecithin (Sunflower). Blend, Mix or Shake 1 rounded scoop (30g) with 5 oz (150 ml, 3/4 of a cup) of cold water or low-fat milk, depending on desired taste and consistency, anytime you want an ultra-premium high-protein beverage. Use only as directed. For adults use only. Consult a health care practitioner prior to use if you are pregnant or breastfeeding; if you have liver or kidney disease, or if you have been instructed to follow a low protein diet. Do not use if inner seal is broken. Store in a cool, dry place. KEEP OUT OF REACH OF CHILDREN. Contains protein derived from milk and lecithin derived from soy (less than 1%). Produced in a facility that also handles egg, soy, peanut and wheat products. Protein Advisory: ALLMAX protein products contain absolutely zero protein sourced from China. IsoFlex is 100% sourced from the United States. Up above, Mike and CJ review it. This is the high quality stuff, and you will pay for it. That said, if you are done messing around with cheap-o stuff, this is the way to go. That said, there *is* a little bit of "label trickery" going on here. See the discussion in the video (in the notes on the screen and in the description) for more info. Overall, though, we're happy that the amino acid profile is fully disclosed, and the trickery seems to be relatively benign. "IsoFlex contains 27 grams of Whey Protein Isolate per scoop!" Open up an IsoFlex container and the smell alone sets it apart. Its pleasant smell sets the stage for a great shake. In terms of the flavoring, what really makes IsoFlex stand out are the actual chocolate chips in the chocolate flavor which provide a nice consistency, the real pieces of strawberry in the Strawberry flavor and the vanilla beans in the Vanilla flavor. As well, many found when mixed with ice the Chocolate Peanut flavor resembles Reese's Pieces and you can't get much better than that! WPI (Whey Protein Isolate) Complex [WPI Fortified]: CTP (Cold Temperature Process), cross- flow microfiltered whey protein isolate, WPI (97% Whey Protein Isolate) and Synermune Colostrum, a natural source of EGF, IGF-1 (growth factor). This high-quality whey protein isolate complex can help you reach your body-shaping goals. NOS Complex [Ultra-Flow Delivery]: Contains hydrolyzed vegetable protein, folic acid and N-acetyl-cystine (N.A.C). Designed to increase blood flow and increase Nitrogen and Whey peptide delivery. It can also boost nitric oxide levels, thereby speeding up recovery and protein delivery to muscle tissues. Glutamine Complex [GLUTAMAX TECHNOLOGY]: Naturally occurring glutamine peptides. Designed to improve recovery and provide immune support. IS Complex [Rapid Absorption]: Alpha Lipoic Acid (ALA), d-Pinitol and 4-Hydroxylsoleucine. Designed to increase protein uptake and insulin support. IsoFlex protein powder is extracted through CTP (Cold Temperature Process) Microfiltration; this is a Cross-Flow Microfiltration (CFM) process that removes the larger, less absorbable protein molecules while filtering out fat, lactose and ash which are normally present in whey concentrates and other lower quality protein powders. The filtration membranes used for in the CFM process are extraordinarily fine and have the ability to remove even more lactose, ash and fat than the process of ultra-filtration which is used for lower quality whey protein products. Using this sophisticated process ALLMAX is able to produce IsoFlex, a superior Ultra-Pure Protein that maintains an optimal macronutrutient ratio, yielding 27 g Protein, 1 g Carbohydrate and between 0.2 g and 0.5 g Fat (slight variations with each flavor). "It is extracted through CTP (Cold Temperature Process) Microfiltration." CFM is one of the best methods to extract protein on the market today. This manufacturing process is far superior to some of the others to process an extremely pure isolate. The whole process takes place at a chilly 4 degrees Celsius, or 39 degrees Fahrenheit and leaves almost 100% of the protein and peptides in tack it also yields to highest amount of undenatured (bio-active) protein available. "The low temperature microfiltration provides undenatured protein with many bioactive whey protein fractions." Our whey protein isolates are manufactured by "chilling" or low temperature microfiltration process and dried by indirect heat. The low temperature microfiltration process allows the Iso-Chill whey protein isolates to provide undenatured protein with a full balance of bioactive whey protein fractions, including immunoglobulin, lactoferrin and glycomacropeptides (GMP). "IsoFlex is 98% lactose free!" Other whey processing technologies using higher temperatures cause irreversible unfolding of the protein fractions that can drastically reduce the biological activity of the protein. Based on solubility at pH of 4.6, IsoFlex Whey Protein Isolate has a mere 3% denatured proteins, which is approximately 10% less than ion-exchange whey protein isolates and typically less than other microfiltration whey protein isolates. IsoFlex Whey Protein Isolates also contain up to 12 times more native GMP than ion-exchange whey protein isolates. How is Whey Protein Isolate Produced? The watery liquid portion that remains is filtered through a process called microfiltration process; to remove lactose and ash. The concentrated liquid goes through the cross flow microfiltration process. Which is where the whey is isolated by being driven through extremely fine ceramic membranes. This process eliminates the need for harsh chemicals used in other processes. The whey is dried and water is removed. Finally, pure whey protein isolate is packaged in its container. All of these steps are performed at a pharmaceutically licensed manufacturing facility to ensure quality and integrity. Every ingredient added and every lot produced is independently lab tested for purity and quality to ensure consistent quality every time. "IsoFlex contains 90% pure whey Protein." 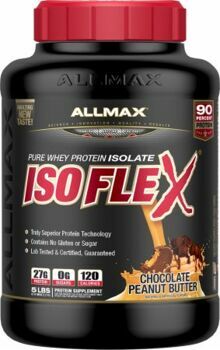 As an isolate IsoFlex contains 90% of pure whey protein. Whey protein concentrates and blends only contain about 75-85% protein as they also contain lactose and fats. IsoFlex represents the highest in Whey Protein Isolate supplementation yielding an amazing 90% pure (bioactive) protein per scoop! It is also 98% lactose free, which makes it an ideal choice for those who are lactose sensitive. Furthermore, IsoFlex is manufactured in the US with US Dairy Cows. ALLMAX protein products contain absolutely zero protein sourced from China. IsoFlex is 100% sourced from the United States. "IsoFlex whey protein isolate matrix, for the taste you crave and the results you demand!"